All bar one of the eight seeded players in the Men’s Open draw progressed to the second round of the Victorian Open Squash Championships at the Mulgrave Country Club on Wednesday night (AEST). Following qualifying matches held on Tuesday evening, the opening round of the Men's PSA M10 event main draw came and went with few surprise results. Hong Kong’s Tsz Kwan Lau  was the only seeded player not to make it to the second round, going down in straight games to France’s Victor Crouin. In a 40-minute struggle, Crouin was able to outlast his higher ranked opponent in each game to win 11-6, 11-6, 14-12. Elsewhere in the Men’s Open, local Melbourne favourite and number one seed Rex Hedrick ensured his quest to return to the Victorian Open decider in 2017 got off to the best possible start, accounting for wild card Nick Calvert in straight games. Hedrick was joined in the second round by fellow top seeds Piedro Schweertman  and Harinder Pal Singh Sandhu , who also recorded straight game wins. 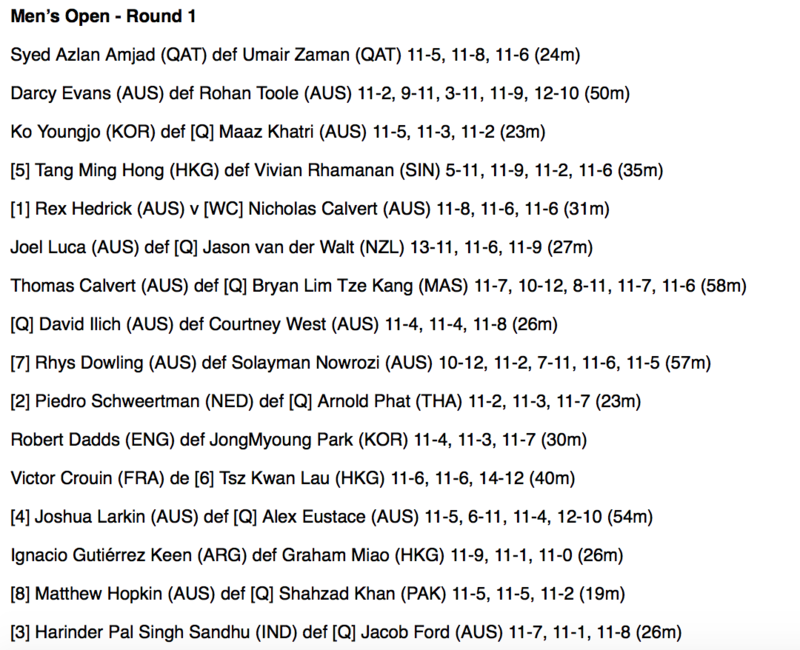 The remaining seeded players to progress included three Aussies in Joshua Larkin , Rhys Dowling  and Matthew Hopkin , along with Hong Kong’s Tang Ming Hong . A full list of opening round results from the Victorian Men’s Open tournament can be found here. In the Women’s PSA W10 event, the second and final round of qualifying was completed, with Round 1 matches getting underway on Thursday night. 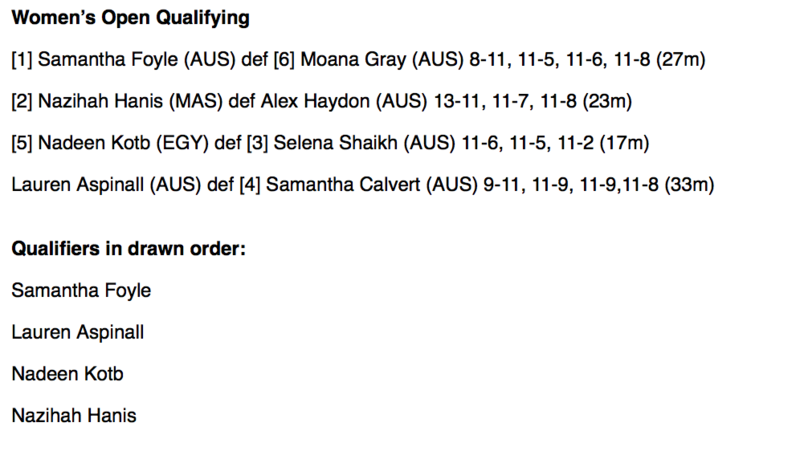 Samantha Foyle and Lauren Aspinall made it through to the main draw by winning both of their qualifying matches, meaning half the Women’s Open field will be filled by Australians. Malaysia’s Nazihah Hanis and Egypt’s Nadeen Kotb were the other qualifiers to progress. Opening round results from the Victorian Women’s Open qualifying can be found here. Day 3 of the 2017 Victorian Open will resume on Thursday 5:45pm AEST, with the second round of the Men's PSA M10 tournament and the first round of Women’s PSA W10 tournament taking place. Image above: Men's Open top seed and local favourite Rex Hedrick has progressed to the second round of the 2017 Victorian Open with a straight games win over wild card Nick Calvert.